Park on right next to Catherine Furnace. NOTE: If driving from the west, and Google Map Directions suggests using the 'Huff Trail', note this is not a drivable road. Enter the GWNF at Catherine Furnace instead. 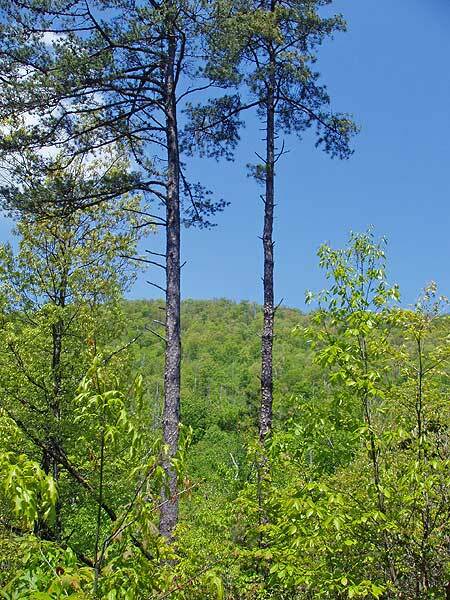 This hike has old growth forest on Roaring Run, small waterfalls along Pitt Spring Run and a great view of the Luray Valley from the Pitt Spring Overlook. This is another one of those hikes that has a bit of everything. However, at 10.5 miles it can be a long one day loop. 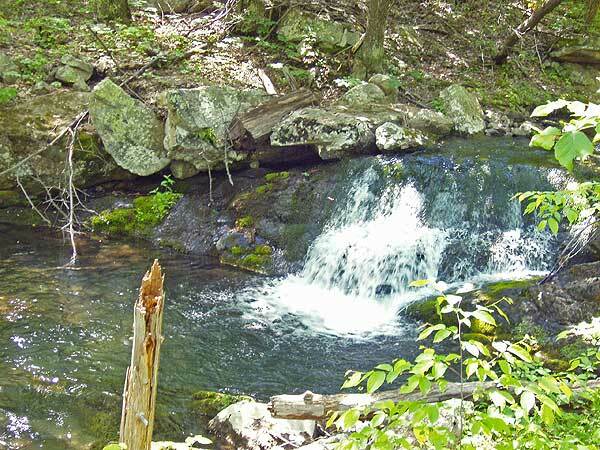 Start the hike by re-crossing Roaring Run over the concrete ford, turn left up the purple blazed Roaring Run Trail. In 0.1 miles cross the run continuing along the trail with Roaring Run now on your right. In 0.9 miles cross the run again and turn left as the trail now heads uphill. Shortly pass an old forestry road on your right, re-cross the run, and pass over a wide FS road 0.5 miles since making the left uphill. Continue along the purple blazed trail and in another 0.5 miles cross a clear cut underground pipeline. The trail will become narrower as it ascends the valley. In 0.3 miles from the pipeline the trail is diverted slightly to to the right. If you miss the detour and continue straight the trail will become blocked with blow downs and will appear to end. Just continue for another 50 yards and you will see the trail uphill 20 yards on your right. Continue on the purple blazed trail as it makes a switchback to the right, then back left before turning uphill in another 0.3 miles. 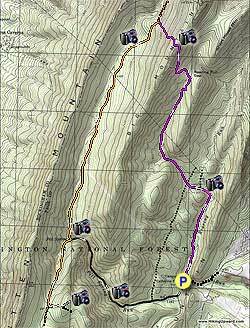 Climb Big Mountain on the purple blazed trail and reach the ridge and small camp site in another 0.5 miles. Descend Big Mountain on it's west side for 0.5 miles where the purple blazed trail ends and arrives at the Big Mountain forestry service (FS) road, which is also the orange blazed Mountain South Trail. Turn left downhill on the orange blazed FS road for 2.8 miles. You may see one or two vehicles, so remember to keep an ear out. Pitt Spring and the continuation of the orange blazed Mountain South Trail turns right where the FS road you have been following makes a sharp left. There is a closed gate and small wooden footbridge that crosses Pitt Spring Run. 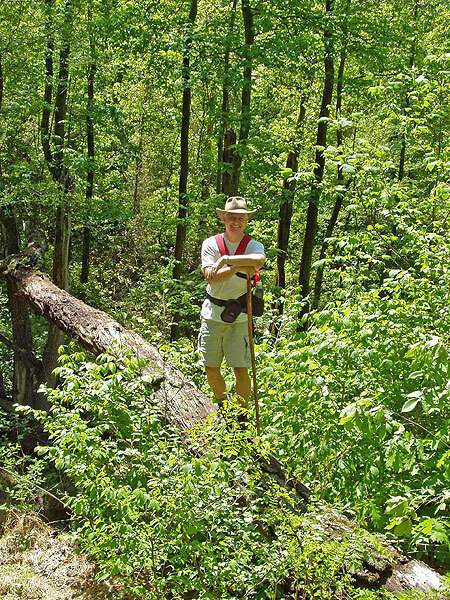 Turn right over the footbridge, pass the spring, and climb the orange blazed Mountain South Trail for 1.0 mile to the intersection of the white blazed Pitt Spring Overlook Trail. Turn left on the white blazed trail and in 0.2 miles pass a side trail that goes to the right. 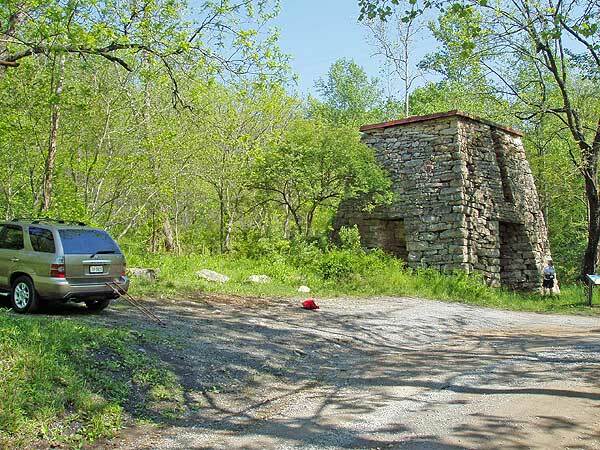 In another 0.1 miles arrive at the Pitt Spring Overlook and foundation of an old lookout tower. Return back down the white blaze trail, turn right on the orange blazed trail retracing your route back to Pitt Spring, and re-crossing the footbridge over Pitt Spring Run. Turn right downhill on the FS road you had been following earlier. The FS road is narrow at this point so remember to keep an ear out for traffic. Pass an old FS road that heads uphill on the left in 1.4 miles, and in another 0.5 miles TURN LEFT where the road forks (remaining straight crosses a concrete ford over Pitt Spring Run). In 0.2 miles arrive back at Catherine Furnace and the parking area. Took two days. Hiked counter clockwise from the furnace. Camped at the northernmost point of the hike at the peak. There's a fire ring and space for just 1 tent. 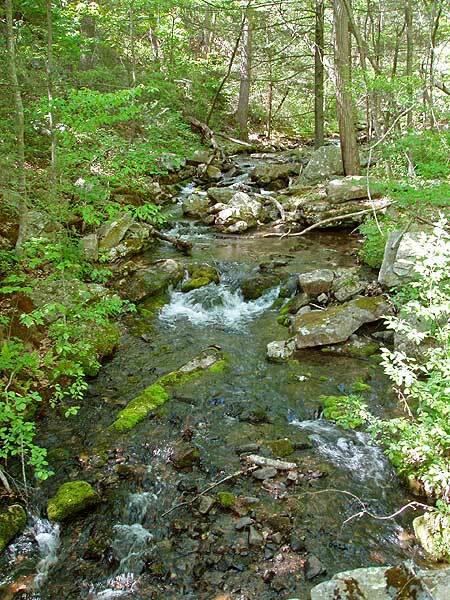 This is also the furthest away from any water so make sure you bring all the water you need up the mountain with you. Very nice overall hike, moderate activity with some good ups, but an easy down grade along the fire road. Great camping near Pitt Spring and I'd recommend that for the majority of trips. A beautiful area and a great hike but a lot trash everywhere: bottles, beer cans, sofas, a deer carcass close to the creek, etc. This is an area I camp in regularly. Overall this is a beautiful area however, the local rednecks have trashed it. There is trash littering all the campsites, girdled trees, spray painted rocks trees, whatever. The miscreants roar through the roads until the wee hours of the night whooping & hollering drunkenly. Recently several of the campsite have had large rocks places in front of them I assume to thwart people from pulling thier cars right into the campsites. Hopefully this is a sign the Rangers are taking action. It would be nice to see this place cleaned up & the people that destroy it prosecuted. It really is a shame as I stated before the area is quite beautiful, it's just been trash by inconsiderate yahoo looking for a place to party. We were fairly disappointed with this hike. As noted in the description, you will be walking a forest road half of the time. I guess we just made a wrong assumption the level of traffic and condition of the road. 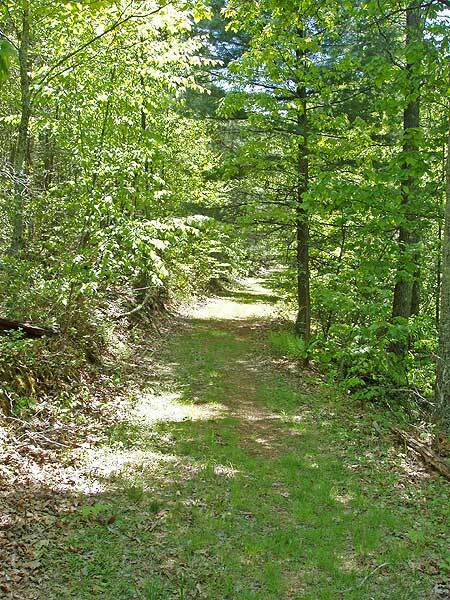 The 2.8 miles along the orange trail is a very well maintained loose gravel road. From the end of this segment back to the parking area is a beautiful hike along a creek with a lot of rapids and falls, but again it is a continuation of the forest road. We were passed by no less than 7 cars, some of which didn’t even slow down when passing us…because of this, I have a hard time rating this as a 5 star for solitude. As for the 5 stars for camping, I suggest that you don’t carry your packs the entire distance like we did. The campsites are much better suited for car-camping since most are located along side the road. Some of the campsites I would consider excellent, with established fire rings and right along side the creek. I have a feeling that we will be driving here again this summer to spend the weekend, but not for the hiking. not a great day for a hike, but still, it's a hike, so it's not all bad. pretty much overcast, but not hot or cold, nice 50s or 60s temps. we followed the route as laid out here, and had no problems with directions. the pushes to both summits were quite strenuous, good sweats, both of them. the first summit is wooded, so no views. 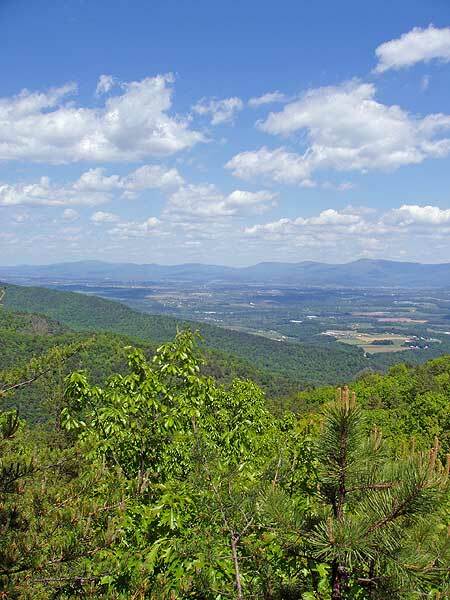 the second summit, the out-and-back side trail, had a nice rock outcropping with views of the Shenandoah valley and Park to the east. lots of hawks out riding the contrails. the 2.8 mile fire road walk was actually pleasant...it got us out of the green tunnel and provided views of the ridge on both sides of valley we were in. no cars, just two bicyclists. did see one car toward the very end of the hike near the furnace. also enjoyed some of the creek/run views...when the water is warmer the swimming holes will be active with locals i'm sure (lots of makeshift camping spots with fire pits on the various fire roads). overall a pleasant hike that yielded a solid workout, if unspectacular vistas.